The soups on in Penticton! 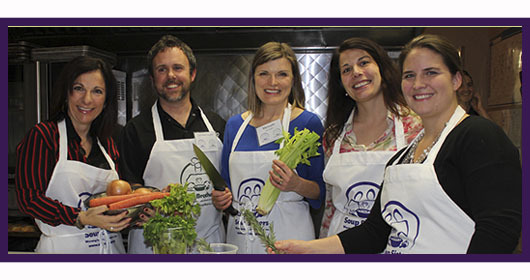 Soup Sisters Penticton launched on Monday, February 16, 2015 in partnership with the Brodo Kitchen and in support of the South Okanagan Women in Need Society. Roll up your sleeves to make delicious, nutritious soups for SOWINS in the renowned comfort of Brodo Kitchen. Join 16 to 20 participants to lovingly preparing 200 servings of soup under the professional guidance and enthusiastic leadership of Chef Paul Cecconi, Executive Chef and Owner of Brodo Kitchen.